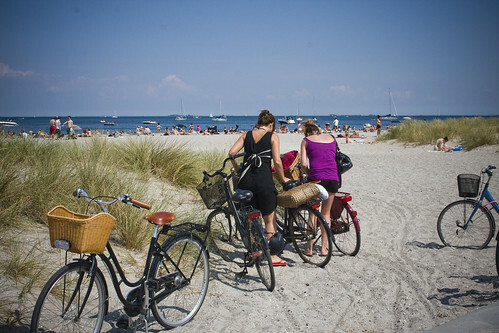 If there's one place that bicycles congregate apart from outside train stations, it's the beaches of Copenhagen. 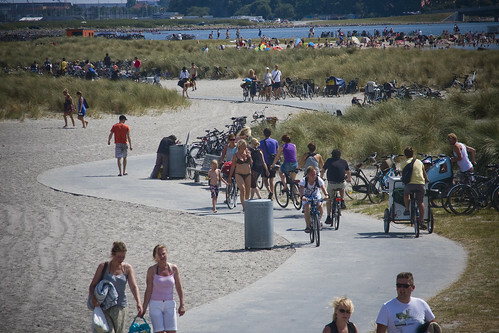 Last year I posted about how the 5000 bicycle racks at one of the main beaches in the city - Amager Strand Park - are hardly adequate for the mammoth number of Copenhageners who take to the beach by bike on hot summer days. Here's a little photo reportage from a couple of weeks back. 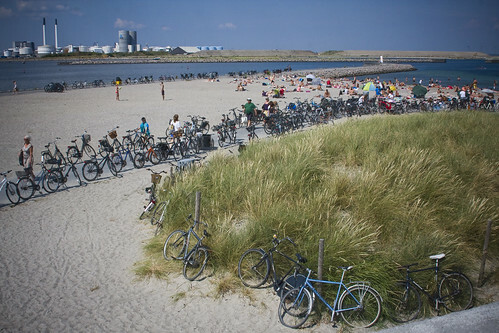 It's quite telling that while approaching the beach with my boy I heard many people remark about the number of bicycles. "Look at all the bicycles!" "I can't believe how many bicycles there are!" 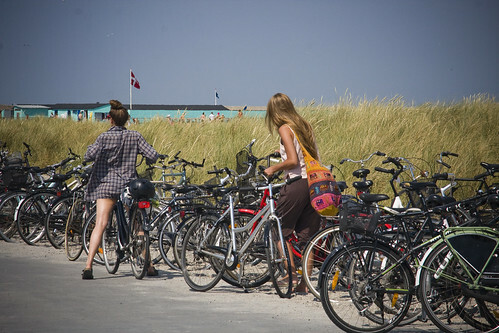 These comments are from hard to impress Copenhageners who are used to seeing armadas of bikes each day. I even am amazed every time. The racks are filled up quickly on a day like this, with the temperature over 30 degrees. 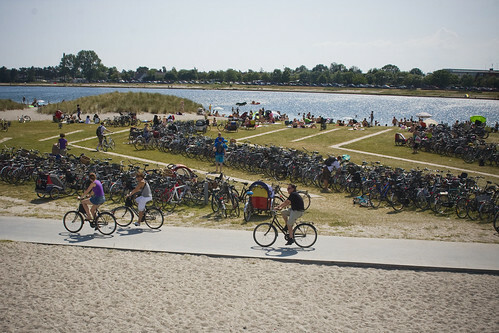 There are three bridges over a lagoon to the main beach and at each one there are clusters of bike racks like in the photo above. This beach is the closest to the city centre. A 10-15 minute bike ride from the City Hall Square, so it gets the most visitors. There are many other beaches around the city, though. When the racks get filled up, unofficial 'overflow parking' takes over. 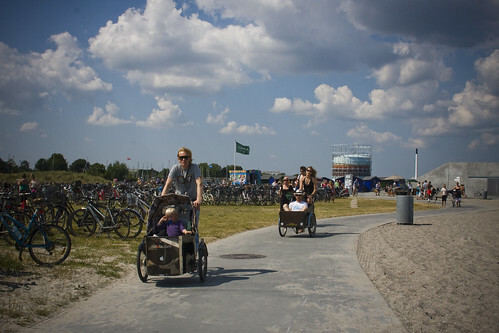 Most of the bikes are placed along the winding path along the stretch of the beach. Here's the pathway. The pace is casual and calm. There's no hurry when you're at the beach. Many people just want to get as close to the water as possible. 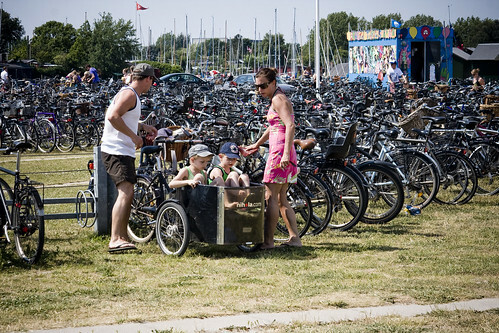 The array of bicycle types is a feast for the eyes. Every type imaginable is present. And when arriving sustainably, you get a sustainable view. Looking out at the world's first offshore wind turbine park. 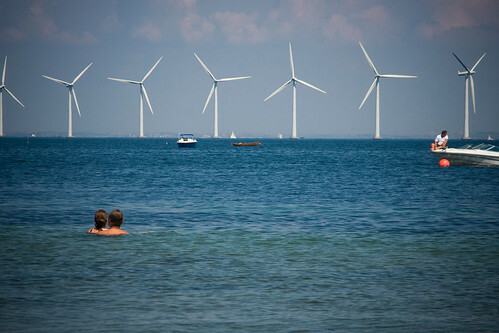 27 wind turbines on the outer harbour provide the city with 3-4% of her energy needs. So aesthetic to look at, in my opinion.